Retreating to the garden after a long hard day can be a great way to relax and unwind. 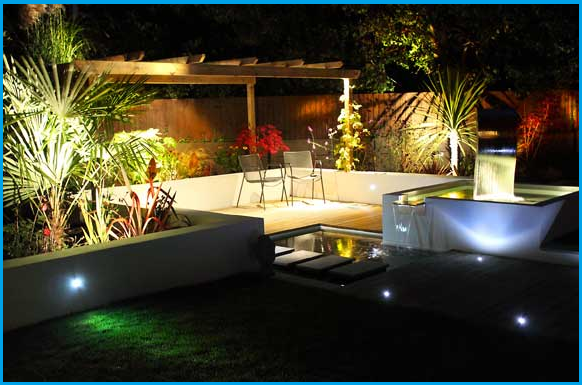 Whether you live in a huge country house with beautiful vast green grounds or you’re in Bristol with a roof terrace overlooking the Floating Harbour, garden lighting can massively improve your time spent outdoors. Many of us already have some sort of garden lighting implemented outside. Maybe it’s a security light which switches on when the sensor is triggered or perhaps it’s an attractive bollard or spike light leading the way up the garden path. The practicality and safety attached to the odd garden light is obvious, yet there are so many other textures and arrangements covered in garden lighting that can help to improve the way in which your garden feels, breathes and illuminates at night time. Nearly every garden has some sort of domineering feature. It could be a tree, a bed of plants, some trellis, ornaments or a water fountain, whatever it is, whenever you are out in the garden you can't help but stare. 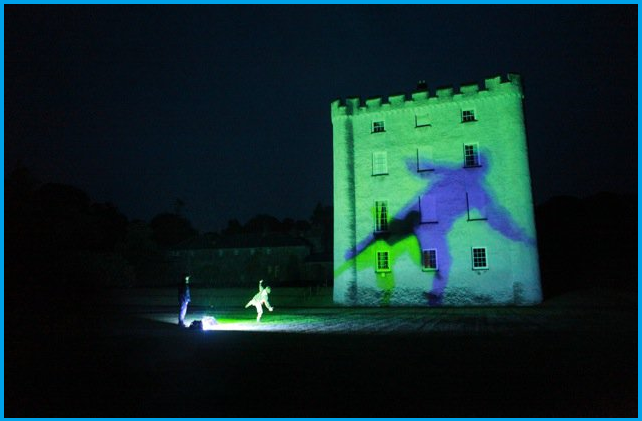 So why not further enhance your feature by including some lighting to accompany it's structure? Water has always been a great communicator with light, so expanding the presence of your water feature is easily achievable. However if you aren’t luckily enough to be graced with the expenditure or space to install a water feature, then some architectural plants or trees can add to the drama of your garden. Trees and plants are conductive to lighting, multi-stem shapes allow the light to filter through the canopy to create extra volume and depth. Lit trees can transform the atmosphere of any garden. Moon lighting from above the tree, up lighting the trunk or lighting the canopy from various directions can boost the height, spread and appeal of the tree. You can turn your tree or architectural plants from a natural focal point in the day time into a glistening stand-out feature at night. If you ask any professional garden landscaper or interior designer about lighting techniques they always seem to mention the importance of layers. Assembling carefully thought out and well-positioned lighting has a huge influence on the feel and atmosphere of an area. The contrast between dark and light objects defines the atmosphere in most landscapes; so in a small and personal space such as a garden, this reflective feeling is nothing but amplified. We have a great amount of control over the appearance of our garden. This is particularly the case at night time, as unattractive or unused areas can remain unseen whereas nicer areas can be highlighted using lights. Planning what lighting to use and where it should sit can cleverly deter or attract people from or to a region. For instance the ground may have an interesting texture, like some stunning patio slates or well pruned grass, well to entice people to look at this section some low level cross light can draw attention below eye level. Trees and other features which stand higher up can also be pointed out, in turn the atmosphere will become low-key. On the other hand lighting systems such as downlighters can make the whole occasion appear formal and strict. Considering the light beam angle and the journey it takes as it travels through the darkness, as well as the strength of its bulb, can all make a combining factor to the atmosphere of your garden. Sometimes less is more. By hiding your lights behind or inside your features, walls or cavities, you can muster mystery and intrigue without even seeing the fitting. The illusion of light is a powerful thing. And the way in which lights are becoming smaller and smaller, it gives great scope to discretely place your lights without the fitting being visible. Cavities, voids, holes and other nooks and crannies can be made into the perfect home for garden lights that don’t need to be seen. The landscape is your playground so why not use it to your advantage. The concealment of lights can also be helped by the colour of the actual light fitting. By avoiding silver or metallic finishes you can hibernate your lights into the surrounding area without them sticking out like a sore thumb. Camouflaged earthier tones such as brown, black and bronze will help you to merge the lights into the back drop without intrusion. Garden LED light strips can act as an extremely nifty solution for lighting up hard to access areas. Concealing LED strip lights such as tapes or tubes into a wall or inside of a flower bed can light up the location without necessarily ever being seen. Sometimes if you position your lighting in such a way you can actually influence other objects, details and feelings inside the garden. If you have a blank canvas to work with such as a plain white wall, and in front of this wall is a tree, a bush or an ornament, then you can position a light in front of this feature to help to create a knock on effect against the wall – ie a silhouette. Purposely developing silhouettes and shadows in the garden to provide extra depth, character and scenery can formulate a bigger picture or story within the garden. Direction of lighting is not only important to distribute an even spread of light or help to highlight a specific area but it can also set the foundations for an experience or a journey throughout the garden. For those who want to create an advanced experience you can set up your light fittings as either check points to stop and marvel at areas or combine them all, to interact with each other and force a fluid journey. Spike lights are mounted on top of a short spike, which is pushed into the ground at the desired location. They can be mains, battery or solar powered, so you have the freedom to choose the best option for your requirements. Prices can range from £5 to £35, and good quality solar or battery powered spike lights give you complete flexibility in where you locate them in your garden. Use garden spike lights in or around flowerbeds, lawns and paths. Bollard lights look like miniature street lights. They work well in larger gardens and outdoor spaces and are available in a range of sizes and styles. As well as giving careful thought to the size and style that you choose, you should also consider how light is emitted. Some bollards provide 360 degrees of light, which are ideal for large, open spaces. Others shine in a single direction, providing a narrower beam of light and illuminating what is directly in front of it, rather than what’s around it. Use garden bollard lights for driveways, wider garden paths and lawns. Spotlights can be mounted in an elevated position on walls or trees and angled downwards; or placed at ground level on a spike, pointing upwards or level. They provide a wide beam of light to illuminate a large area. Spotlights are generally mains or battery powered, however there are also solar powered options, but these will not provide as high a light output. Use outdoor spotlights to illuminate paths, driveways and lawns from above; and trees, bushes and walls from the ground. Bear in mind that this type of light emits a wider splash of light, and are best used in large, open areas; or angled upwards at the base of trees and bushes to illuminate them. Garden wall lights are different from spotlights in that they are decorative light fittings that both provide light to an outdoor area and look good in their own right. Most wall lights are mains powered but there are solar and battery powered options out there as well. Floodlights emit a very wide beam of bright light, and are usually used as security lights with a PIR sensor. Generally, using floodlights in your garden will simply wash out the effects of any other lighting, however they can be used in a similar fashion to spotlights when positioned at ground level. 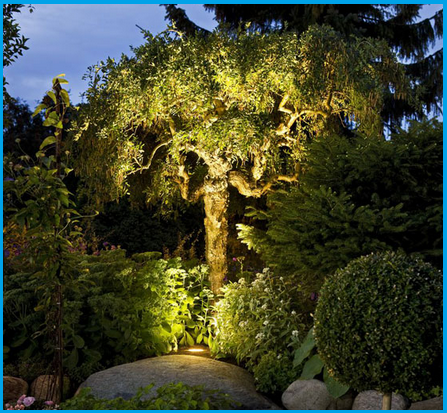 If you have a large tree or wall that you want to light up, a floodlight at the base of the feature might be more effective than a spotlight, due to the higher light output. In-ground lights are essentially a spotlight that is embedded in the ground, with the face of the fitting sitting flush with the surface of the ground. In-ground lights are most commonly used at the edges of driveways and paths, and IP68 rated fittings can be completely submerged in water features. They can also be installed horizontally into the face of steps and walls. 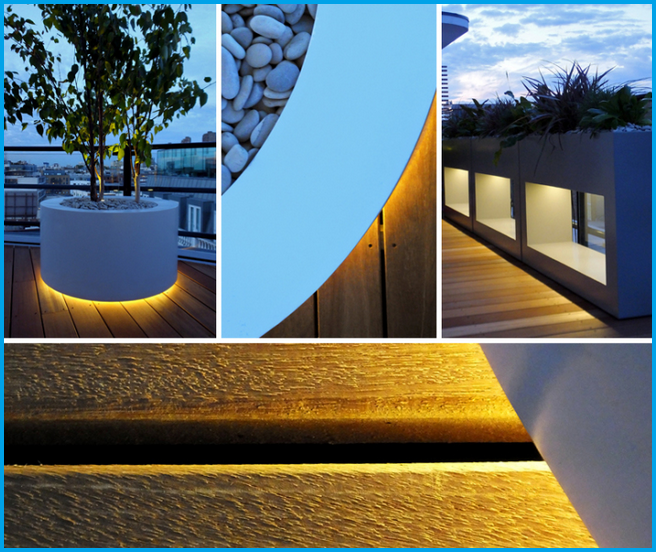 Deck lighting fittings are similar to in-ground light fittings. The difference is that they are shorter as they will be fitted into wood rather than the ground. They can, however, also be used as ground lights if conditions allow, for example in small flowerbeds or rockeries. Candle light is ideal for creating a warm, cosy atmosphere in the evenings. LED candle lights provide a realistic effect, last a lot longer than real candles and aren’t affected by the wind. Use with patio furniture or along the edges of paths and water features. String lights and lantern lights are used for decorative purposes, and can be used along walls, tree branches, bushes and gazebos. Opt for battery or solar powered lights for an affordable and versatile solution, or invest in mains powered for permanent use. Call or email Congresbury Electrical to discuss your requirements. © 2017 Congresbury Electrical. All Rights Reserved.